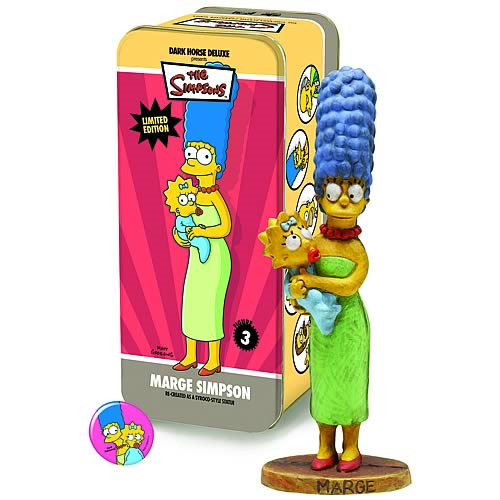 While the statuettes in the series were originally based on characters from newspaper strips, this companion series features Syroco's uniquely "primitive but charming" treatment on one of the modern era's most iconic, if dysfunctional, families- none other than the Simpsons! We are excited to present the third release of the group- Marge, with Maggie in tow. She puts up with so much! Packaged in a special litho-printed, full-color tin box with a vintage-style pin-back button and booklet. She's a limited edition of 550 numbered pieces that stands 5-inches tall. Order yours today!